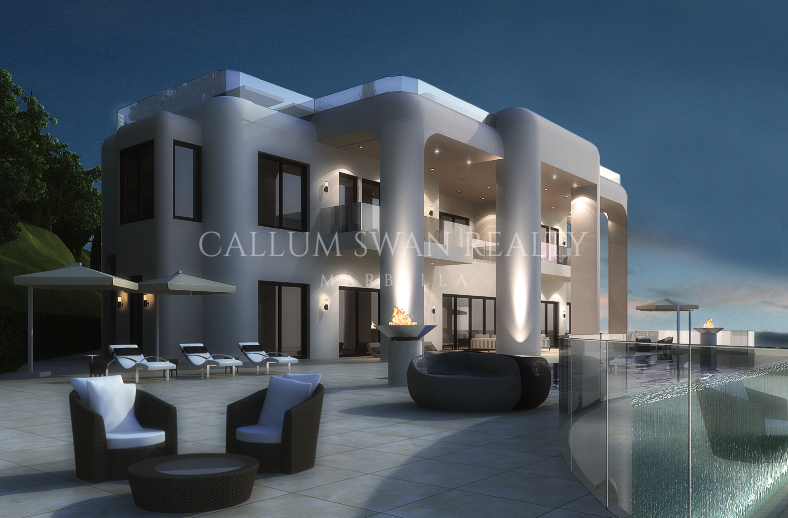 Amazingly, considering the proliferation of luxurious villas and penthouses, it is often said that Marbella lacks the kind of properties that belong to the upper international echelons. With the creation of this singular home in La Zagaleta, the gap is being bridged. Marbella is not only rich in luxurious, multi-million euro villas and penthouses, it is in many ways characterised by them. How is it possible then that this glamorous resort town, for all its upmarket credentials, lacks the kind of A-list properties that fetch stratospheric prices in London, Paris, Dubai, Monaco, the Côte d’Azur and large parts of the USA? Yes, in the very finest addresses, such as the Golden Mile, La Zagaleta and seaside Los Monteros, sums in excess of 20 million euros can be achieved, but such properties remain rare and those that combine a top location with the kind of property that the international elite demand today, are even scarcer. A home that does combine these factors, and qualifies as modern A-list real estate of the kind found in the most exclusive locations in the world, is this new villa arising in a prime location within La Zagaleta. Contemporary in its architectural styling, it is also unique, not a pastiche of mainstream designs but a property with a very unique look and very personal character and ambience. The long list of must-have elements of today’s top level home are all there, ensuring that this is a 21st century palace in the true sense of the word – made for living, relaxing and entertaining without a want for anything. What goes into the making of a modern mansion? We visit palaces and chateaux, and marvel at their opulence, scale and unending attention to artistic detail, not to mention the precious materials that went into their making. Yet we don’t always realise that today’s grandest homes are a representation of the same process, and therefore directly linked to the mansions, palaces and stately homes of the past. Born of the same desire to achieve earthly perfection and create an impressive personal oasis of elegance and luxury, they require an unerring dedication to nothing less than the very best. With his characteristic whit, Winston Churchill stated that he was “easily satisfied with the very best,” so one would assume that he would have been a very happy guest at this mansion in the foothills overlooking Marbella. Indeed, the first step in creating a singular home is finding a suitably imposing location – a real estate truism that is simply inescapable. For this the owner had to purchase an existing villa, for the best spots are always the first taken, and replace a charming but ageing home with something that truly embodies luxury and grandeur in the modern day. Tucked discreetly behind trees that flank the large gate, the villa is out of sight from the road but itself enjoys an open window on the world below it, from the golf courses and villa suburbs of Marbella to the shoreline and the Mediterranean Sea that unfolds beyond it. All around the property are hills clad in a green cover of pine and cork oaks, where the estate’s deer roam peacefully. With this prime location as his canvas, the owner has created an ode to modern architecture and premium living on a private domain. And yet it remains imposing, for as you follow the beautifully lightscaped driveway with a 50-metre long water feature to the front entrance you cannot help but be impressed. The huge glass and dark wood entrance plays a large part in this, but it is when you cross the threshold that your breath will most likely be taken away, for the first thing you see as you enter the house is a 15-metre fountain that forms a wall of water trickling down a central atrium from the upper levels. It is rude to stare, but this is the kind of feature that deserves admiration, and the visual spectacle it produces has a mesmerising effect. 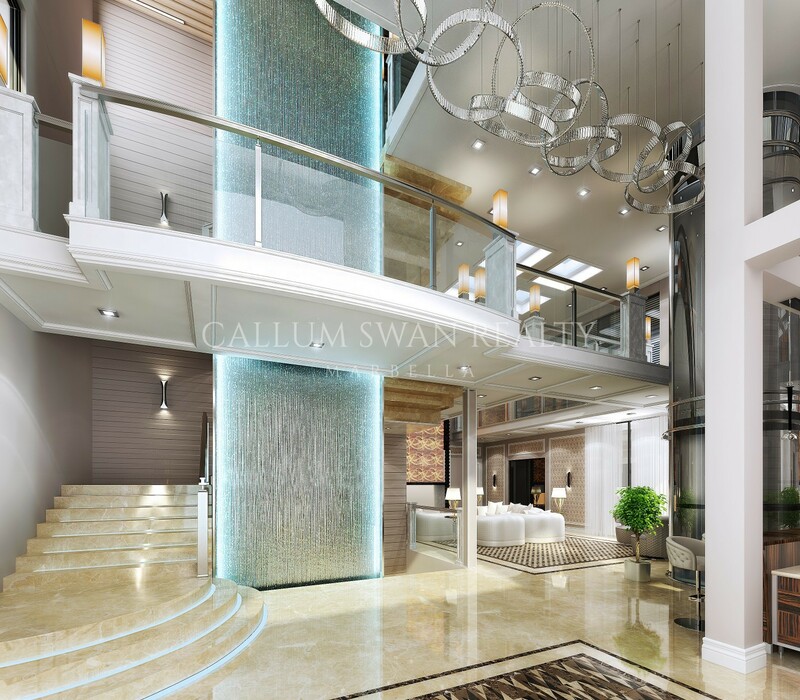 You will by now have noticed that this cascade is backed by a wall dressed in magnificent honey-toned onyx – a reminder of the beautiful materials used in the construction and decoration of this unique home. The finest marble sourced from around the world covers the floors, leading past another of the villa’s A-1 features, a glass lift that connects the ground floor living quarters, upper level private quarters, entertainment area on the lower floor and the panoramic rooftop chill out lounge as an alternative to the elegant stairs that flow along the atrium. Continue on and you realise that this really is a Marbella property on another level, with intricately hand-laid floor tiles, tall ceilings and grand windows that let the panoramic views in – not to mention under-the-skin intelligence that manages everything from lighting and fountains to floodlit projections, climate control, security and a host of other features. The living room is naturally a study in comfort and elegance, the formal dining room impressive and the modern kitchen the very best available today, combining form and function to perfection. Step out onto the large but elegant terrace and your glance is directed along the magnificent swimming pool to the broad horizon of sea and sky interspersed with the greenery of the surroundings. Thinking outside of convention and driven by a desire for the very best, the owner has made this a labour of love – and it shows. No developer would create a home in this way; thinking of their profit margin they cannot but approach the process in a more clinical fashion, yet here arises a villa with all the artistry and delicacy bestowed by someone with a vision to create a truly exceptional home. Set free from the usual constraints in this way, it is a singular home on another level altogether. The influences that have gone into the making of this singular villa are many, but a recognisable theme is the cross-fertilisation of ideas taken from the very finest floating palaces of our day. The level of opulence attained in the world’s most luxurious yachts is such that their décor now inspires the furnishing and dressing of homes of this standard. 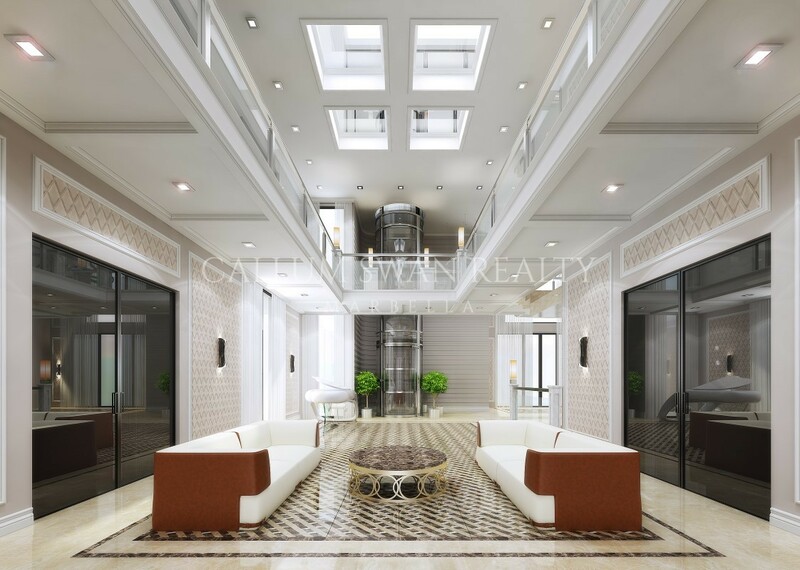 This much is evident in the magnificent polished wood that adorns part of the living area, extending from the salon to the equally stylish open kitchen with polished perfection. It is a highly effective decorative combination, especially when melded with the very finest tastefully styled furniture pieces and crystal chandeliers that accentuate the home’s generous proportions. This level of lacquered elegance is also visible in the private quarters, each of which is more luxuriant than the next, complete with the most cosseting beds flanked by comfortable seating areas and handmade cabinets that look like they were crafted by Louis Vuitton himself. Here, as throughout the home, the walls are not merely painted or plastered but consist of multiple layers perfectly laid to produce a clean, crisp surface whose smooth perfection hugs the villa’s often rounded architecture with geometric precision. Where wood detailing, wallpaper or, as in the bathrooms, inlaid tiles are used, they are finished to a level not normally seen in these parts. The effect is a case study in contemporary elegance with a nod to classical and Art Deco styles. This is further embellished with floors and walls in exquisite red onyx from Pakistan or richly veined lacquered wooden furniture pieces that speak of taste, refinement and the very best quality money can buy. Like the seven bedrooms, the twelve accompanying bathrooms are private domains of pampering luxury and comfort, some featuring tiles and soft furnishings while others are clad in the finest marble and include modern stylistic details. Even the private office is a study in timeless appeal, with handcrafted desks and wood panelling that call to mind Art Deco and nautical references yet above all speak of quality. Take the lift or follow the steps down to the lower floor and you enter a world of private indulgence – as if the rest of the home did not already qualify as such! Polished hardwood ceilings, tiger eye onyx walls and columns, and gently trickling water features combine with elegant sitting corners in soft, plush white leather to provide the backdrop for an entertainment area that redefines the concept altogether. Instead of separated rooms dedicated to a singular function the various entertainment options all flow into one exquisitely styled and finished space. Within a single glance you spot seating areas for lively socialising or relaxing, a magnificent bar that could grace the most luxurious deluxe hotel, a cinema area with plush seating and state of the art equipment, bridge tables and even a ten pin bowling alley in the home’s customary standard of finishing. Billiards, a virtual driving range, a simply stunning wine cellar and a true spa – all just a few steps away. For the latter you will enter gorgeous marble bathrooms and dressing rooms before succumbing to the equally opulent sauna, steam bath and real ice room, not to mention a sensually styled indoor swimming pool with large porthole windows—another reminder of the interior’s nautical links. This is not a subterranean space either, for open a door and you encounter an outdoor bar and terrace area – overlooking your own putting green – that represents the best of today’s style. The same is true of the rooftop lounge, from which you can contemplate beautiful views across the coastal plain and shoreline to the Mediterranean as you relax in one of the luxuriant seating areas, enjoy a drink at the bar or just generally make the most of the amenities of the home’s very own beach club setting. Add a state of the art gym that overlooks the surrounding greenery and coastline from an elevated position and you begin to get a picture of just how complete this magnificent villa is. 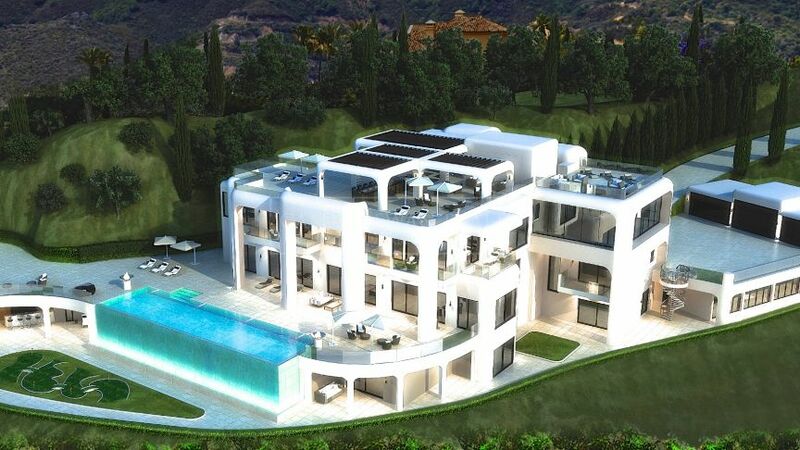 Along with a private, secure setting in one of Marbella’s finest addresses, this is the stuff that A-list homes in the 21st century are made of.